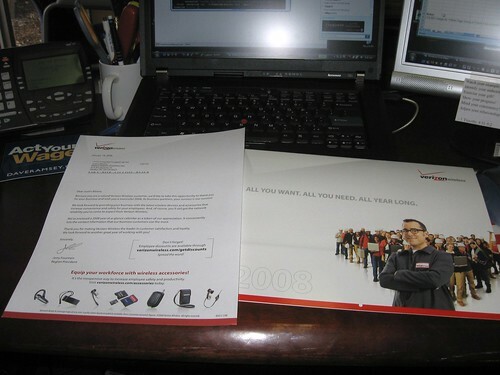 Gee, thanks Verizon! 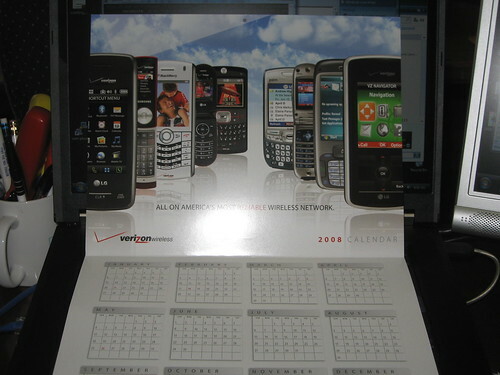 A year-long, one-half-page calendar with advertising on the upper-half of the page that will no doubt, be WAY outdated before December ever rolls around. Guess I can keep dreaming of an i760, which, by-the-way, is far and away the greatest smartphone they have, and it’s not even pictured! Yeah, they pictured a 755p (Palm OS-based) with what appears to be a mocked-up GUI that has the shiny, new Vista-ish Windows logo at the top. Very funny, at least to me.